Excellent. I have had no hitches with the software and the support has always been great. They are always looking to improve and always help with tweaking my app.It worked straight away and I could see what I was getting before I locked in by looking at other apps on the Disciple platform. I needed something with Push notifications and Disciple delivered. It worked straight away and I could see what I was getting before I locked in by looking at other apps on the Disciple platform. I needed something with Push notifications and Disciple delivered. As far as a social platform goes it is not quite as good as the likes of Twitter and Facebook but that is to be expected. The CMS took a little while to learn but it didn't take long to get to know it. If you're looking for the functionality they offer, this is a clear winner. Software is stable and simple. Value is great and the customer support if very very strong. more than I would have expected given the price. Thanks guys!It's simple, straight forward and easy to configure with the help of their great support staff. It's simple, straight forward and easy to configure with the help of their great support staff. There were some things I'd like to customize that I couldn't, but those needs were pretty unique to our needs. Many of the tweaks we wanted they were able to deliver pretty quickly. Outstanding Product and Exceptional Customer Experience! First class experience from making the first contact with Disciple to getting our apps live in the app stores. The software is outstanding for the price we pay each month and they really do have exceptional customer service. When people with uber tech experience ask us how we created our app.....you know you have a super product and for a fraction of the cost of doing your own. Thank you Disciple. Our community members love how easy it is to use. They also tell us how great the app looks. It really does feel and look like our own app with all the benefits of the software updates and new features all for the same monthly fee. Our community members love how easy it is to use. They also tell us how great the app looks. It really does feel and look like our own app with all the benefits of the software updates and new features all for the same monthly fee. CMS is still relatively new so doesn't all of the short cuts you would want. However these are all on the way so very happy that the CMS features will grow with our community. I'm very pleased to date with Disciple's product, service, training and support, and look forward to a long future with them.Disciple does a stellar job working with the individual needs of their clients. Great communication, training, and an evolving product that I think will grow nicely with our needs. Disciple does a stellar job working with the individual needs of their clients. Great communication, training, and an evolving product that I think will grow nicely with our needs. There are some limitations, but there are enhancements coming down the wire that I expect will help fill the voids. Customer service is responsive, but take into consideration any time zone differences, as this results in next-day replies when I have questions or need support. We charge each of our customers a different price based on their community size and requirements. One of our customers is The Rolling Stones and another is a small village in the South of England so we need to have flexible pricing to make our community platform accessible to as many communities as possible. Disciple’s interactive communication features drive 16x more engagement than typically seen on branded social media pages. 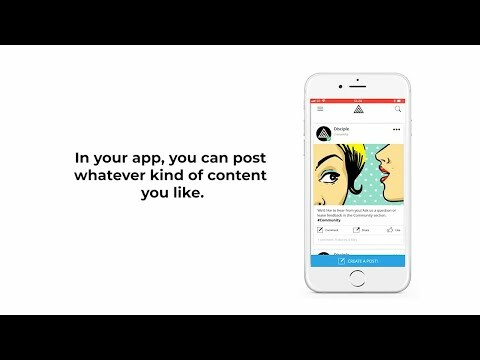 With Disciple, your community app belongs to you and your community. All the best bits of social media without the competition. Below are some frequently asked questions for Disciple. Q. What type of pricing plans does Disciple offer? Q. Who are the typical users of Disciple? Q. What languages does Disciple support? Q. Does Disciple support mobile devices? Q. Does Disciple offer an API? No, Disciple does not have an API available. Q. What other apps does Disciple integrate with? Q. What level of support does Disciple offer?